Welcome to Night Vale is a show that gives us a great example of what intersectional feminism actually looks like in popular media and storytelling. It has excellent female characters, most of whom are women of color; it has characters with disabilities, two queer main characters, and often points out problematic issues surrounding race, sexuality, gender, and disabilities. I am rarely, if ever, disappointed in Welcome to Night Vale, and now I have yet another reason as to why I love this show so much. Welcome to Night Vale is one of the few shows in recent memory to address how sinister the effects of religious colonialism can be on people. Religious colonialism is when the invading culture forces its own religious beliefs onto the native peoples it is conquering and simultaneously demonizes and outlaws the native religious beliefs. Spoilers for the Strex Corp storyline below the cut. To many, the recent story of Strex’s control over Night Vale is one that criticizes consumerism, capitalism, and greed. And it does, kind of, but I don’t think that is the real message of the Strex storyline. The real message is anti-religious colonialism. Strex Corp and Desert Bluffs don’t really begin to have a pivotal role in the WtNV story until the two part episode “Sandstorm”. It’s in these two episodes that we realize no matter how terrifying Night Vale can seem, it is Desert Bluffs that is the truly terrifying place. Despite the seemingly friendly and happy atmosphere it is obvious that underneath it all lies something truly sinister. This sinister feeling is confirmed when Cecil briefly enters Desert Bluffs and tells the listeners that Kevin’s (Desert Bluff’s radio host) studio is covered in human organs and blood. Our God is an awesome God. Much better than that ridiculous god that Desert Bluffs has. When the white man came to our country he had the Bible and we had the land. The white man said to us, ‘let us pray.’ After the prayer, the white man had the land and we had the Bible. And this is exactly what Strex Corp does. They enforce the Smiling God on the people of Night Vale, all while taking the land and attempting to destroy Night Vale’s culture and religion. The actual beliefs of the citizens of Night Vale are left largely unclear in the podcast. Angels are mentioned as living in Night Vale, people are somewhat controlled into worshiping a giant glow cloud, and it’s said that some of the religious founders of Night Vale wore crowns of meat. Then there is the giant brown stone spire that the citizens of Night Vale are expected to supplicate themselves before and after their traditional Thanksgiving feasts. The citizens crawl on their knees to the brown stone spire, thanking it for what it has done and not done. So while the religion or various religions of Night Vale are never clearly defined, it is clear that they certainly exist at least in some form. A culture is defined by social forces in a society that shape what is considered acceptable behavior and practices of the people in that area. Religion explains how people should see themselves in the universe, usually these beliefs are influenced by the predominant culture, and in turn a religion will also shape what the culture views as acceptable practices and behaviors. Though Night Vale’s culture and religion is somewhat undefined and varied one of the most common religious and cultural elements almost all Night Vale citizens seem to use are bloodstones. While Strex Corp is menacing from the second it appears in Night Vale, it is in the episode “Numbers” that we discover that Strex Corp is openly worshiping their god in Night Vale, but outlawing the use of bloodstones of Night Vale’s citizens. Before Cecil sneaks out of the studio, he mentions how his producer and program director pray in the office at certain times of the day. I’ll try to gather up my equipment and slip out before my producer Daniel, or my program director Lauren, notice. Usually at this time of day, they are pressed against the wall in the break room, chanting “I TAKE MY WARMTH FROM YOUR GREAT WARMTH. I TAKE MY WARMTH FROM YOUR GREAT WARMTH” over and over, so… I don’t think they’ll miss me. After escaping from the studio, Cecil then explains how Strex Corp is trying to do away with the ritual bloodstones that Night Vale citizens are often described as using. Or, I had to bleed a little on the front doors to make them open, of course, but that’s just part of having a good security system. Our new station owners have been ridding us of all vestiges of bloodstone circles (which they’ve declared illegal), but the station doors are actually carved from reclaimed bloodstone and are permanently attached to the structure, using ancient wisdom lost along with the station architects back in 1942. So, our new owners have had to learn to live with those doors, bleeding on their way out. In “Numbers”, Cecil describes how Strex Corp tried to ban the bloodstones used so often by the Night Vale citizens, but nevertheless these practices still exist despite the efforts of StrexCorp. In this case, a bloodstone is permanently attached to the radio station so there was no way for StrexCorp to remove it, and furthermore they have to participate in using the bloodstone themselves. Though many religions participate/ed in religious colonialism, probably the the most powerful and successful religion to do this was Christianity. While early Christians preached about their faith and spread the message of Christ, they never forced others to join their faith until Christianity gained power by becoming the official religion of Rome. After that, a new Christianity emerged, one with the power to forcibly convert others. Christians now in power persecuted and destroyed pagan temples that still existed in Rome. As Christianity spread into Europe, pagan sites of worship were destroyed and churches were built in their place. 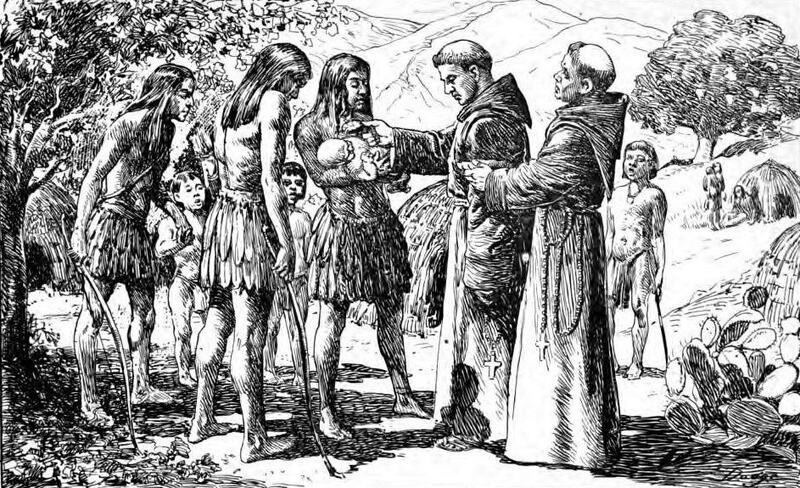 In the Americas, the native peoples’ language, tradition, and religious practices were banned and even declared evil. Native peoples could be killed for witchcraft and worshiping the devil just for practicing their original religious beliefs. On top of this, religious colonialism encourages conversion by promising more rights and freedoms to the conquered people who convert. Sometimes natives converted just to survive but practiced their beliefs in secret; others were defiant but often met with a bloody end. In an earlier episode of Welcome to Night Vale, “The Woman from Italy”, Tamika erects a bloodstone in protest of Strex Corp oppressing Night Vale’s religious practices. Tamika was last seen leading her army through the Ralph’s, shouting to all witnesses that “We are here! We are the beating heart! We are the breathing lungs! We are the lips that chant!” before erecting a blood stone circle in the produce section, in direct defiance of StrexCorp’s recent ban on bloodstone manufacture and use. Tamika is particularly targeted by Strex Corp in order to send a message to those who would stand against their imperial power and well as defy the power of the Smiling God. 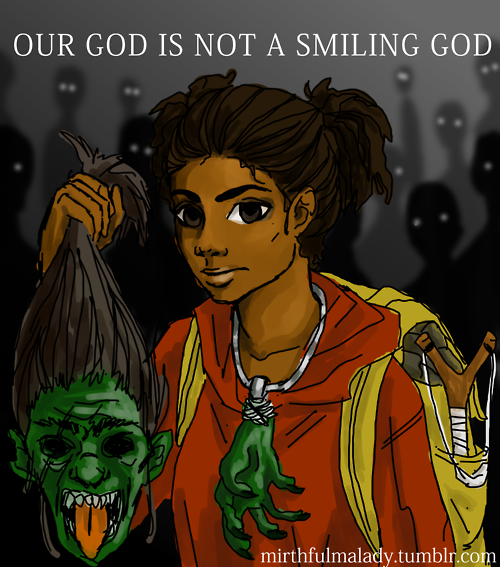 If Strex Corp had succeed in destroying Tamika, they would have sent a strong message to the people of Night Vale—that message being that if they didn’t abandon their beliefs and culture and accept the Smiling God, they would be destroyed. I used to feel that way about Desert Bluffs. So many secrets and conspiracies and darkness in our days. It all felt so important, so permanent! But then we met the Smiling God! Oh, it was so wonderful! The sun stopped setting! Or– maybe there wasn’t a sun anymore. Maybe there was just that other…brighter light. Who knows? I do know that I couldn’t stop smiling. None of us could! And our smiles seemed better, fuller, wider. Soon we had no need for government cover-ups, or secrets. Everything was transparent. Literally. You could see through everything and everyone. The bones, the blood, the scurrying insects inside every human body! There was so much work to be done. And such a wonderful company to do it for! Even the ones that resisted the most at first soon found that they loved the Smiling God more than anyone. Even the most resistant of radio hosts soon found his way to productive work, happy songs, and a wide, gaping smile. So, let’s do this together, Cecil. Believe with me in a Smiling God! Kevin loses all of his identity because of religious colonialism. He says in early episodes that he doesn’t remember how long he has been the voice of Desert Bluffs, and only seems to vaguely remember life before the Smiling God. That is what Strex Corp is trying to do to Night Vale, and what real life colonial powers do/did to native peoples. Religion and culture are usually closely tied together (though obviously they don’t have to be), and the whole point of colonialism is to destroy the identity of the indigenous people. By taking someone’s identity, their past, their beliefs, their traditions and replacing that identity with the identity of occupying forces, those in power are able to dehumanize and control the people they have conquered. Colonialism forces the conquered people to identify everything about their culture as bad and everything about the occupying culture as good. While destroying the native culture’s religion may not totally destroy the culture itself, because of the strong connection between religion and culture, destroying one will have a huge effect on the other. 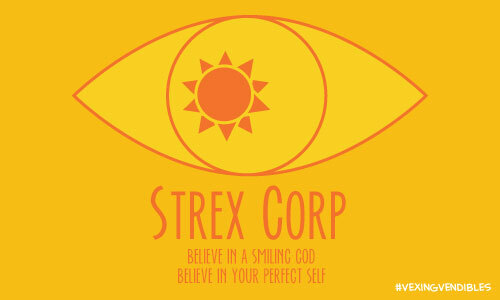 The Night Vale citizens struggle not to lose themselves to Strex Corp and the Smiling God, and ultimately is able to kick all occupying forces out. Desert Bluffs and Kevin are not as lucky. Kevin, and presumably the rest of Desert Bluffs, know nothing but the Smiling God and have lost all of who they used to be. This entry was posted in Oh My Pop Culture Religion, Welcome to Night Vale and tagged colonialism, imperialism, oh my pop culture religion, religious colonialism, Smiling God, Strex Corp, Welcome to Night Vale by Lady Geek Girl. Bookmark the permalink. Pingback: Oh, My Pop Culture Religion: Religious Colonialism in Welcome to Night Vale – Wait… what? Reblogged this on frontier settler colonialism.